"Boy Erased" stars up and coming Lucas Hedges as a sexually unsure 19-year-old, sent to gay conversion therapy. The movies gets a boost from an excellent cast, including Lucas Hedges as the kid, and Nicole Kidman & Russell Crowe as his parents. Based on the memoir of Gerrard Conley, the story boils down to a father-son conflict. As the father, Russell Crowe manages to convey love for his his son, while unable to rise above his assumed alpha male status. In real life, Conley's father is a car dealer and Baptist preacher. Gay conversion camp feels like a concentration camp, with Joel Edgerton (who also directed) as the chief villain. 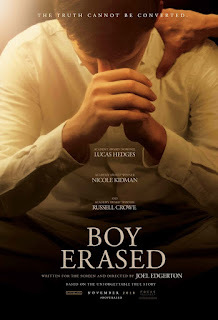 I doubt "Boy Erased" will change any minds, but it avoids a sledge hammer approach. "Boy Erased," 2½ stars, rated "R." Does it deliver what it promises? Family drama with nuance. Is it entertaining? Good performances. Is it worth the price of admission? This one's up to you.